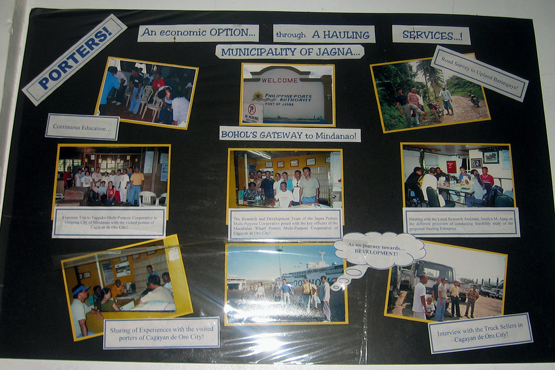 The town of Jagna has a modern port that receives ferries from Mindanao and ships from all around. The port is serviced by a workforce of porters who belong to a multi-purpose cooperative. Porters were interested in using their savings to invest a business that would employ them when not unloading ships. The men were attracted to the idea of a trucking business. As part of the Community Parterning research porcess they went on an information gathering filed trip to Mindanao to look into a cooperative trucking business. Their initial findings convinced them that they did not yet have the capital or organizational capacity to take on such an enterprise. This process of research and discussion helped the porters see that their first step towards livelihood supplementation should be improving their organization. This poster was produced after the porters returned from their fact finding mission to Mindanao. In it they document their dreams and the realities they discovered. This experience was seen to be a positive one that galvanized the membership into improving their organization and tightening up its financial accounts. Since then a small office and shop has been opened by the porters at the wharf, and the dream of further enterprise development is still alive.